Festivals of Nepal reflect Nepalese culture, Nepalese tradition and custom. It plays vital roles in the lives of Nepalese. As the Sun enters the southern hemispheres, people in Nepal celebrate Maghe Sankranti on 14th January. On this very day people take early morning bath if possible in a holy river of Bagmati , put on the best of clean clothes and visit Lord Vishnu's temples to pay their homage to the god with puja items like flowers, incense, fruits etc. At home they read Bhagwad Gita, a sacred Hindu book. Messaging entire body with mustard oil is regarded as very auspicious on this particular day. Nepali family enjoys a hearty delicious meal comprising rice cooked with lentils, yams and sweets like laddu made from seasame and sugarcane paste etc. On this day people in huge numbers gather around Devghat in Chitwan to take a dip into the meeting point of river Kali, Gandaki and Trisuli. Such action is believed to free devotees from sins, cleanse their soul and make them closer to god. This day onwards days get longer and warmer. Basanta Panchami is also called Shri Panchami or Saraswoti Puja and is celebrated on 13th February in the honor of Goddess Saraswoti, goddess of knowledge and learning. This day is very special for students. They take early morning bath, wear clean clothes, worship their books and visit temple of goddess Saraswoti with puja items. Students believe that worshipping the goddess on this day broadens up their knowledge horizon and their studies will progress further fruitfully. Parents who have toddlers at home take them to temples and make them write on the walls of the temple. This day also bears cultural and religious significance for Buddhists who prioritize this day for worshipping God Manjushree. At Hanuman Dhoka in Kathmandu official announcement is made indicating the arrival of spring. Astrologically, Shri Panchami is an ideal day for couples to tie a marriage knot and also for new born babies' name-giving sacrament called nwaran. Lhosar is New Year for Sherpas and Tibetans. They openheartedly enjoy it from 9th to 11th February with delicious feasts, family, relatives, friends, music and dance. They wear finest of clothes and jewellery and exchange gifts with each other. At monasteries lama perform ritual ceremony to bring auspiciousness. Bouddhanath and Swayambhunath stupas are adorned with colorful attractive decorations and so are the houses. People throw roasted barley flour, also called tsampa, on the air as a sign of welcoming their New Year. Maha Shivaratri takes place on 8th March. On this occasion, devotees pay their utmost homage to Lord Shiva. Hindus all over the world gather in Pashupatinath temple to pay their tribute to his almighty. The temple will showcase a worth watching crowd of naked and cannabis inhaled sadhus with ash covered bodies representing lord Shiva and people lined up in thousands. Majority of Hindus take fasting. In the evening or at night they worship Lord Shiva with all the necessary puja items. Hindus at home make bonfire and sit by the fire. According to Hindu Mythology, during the reign of King Hiranyakasyapu entire people of the kingdom were prohibited from worshipping Lord Vishnu and were coerced to worship him instead. The king had immense hatred towards God Vishnu. But for his misfortune, King's own son, Pralhat, was an ardent devotee of Lord Vishnu. When king learnt about this, he grew very furious and implemented extreme cruel measures to make his son forget Vishnu. No matter how cruel the king got his son grew more closer to Vishnu. In one of his ploys, the King assigned his sister, Holika, to burn Pralhad to death. Holika had the power of emitting fire. She took Pralhat into her lap intending to burn him but with Lord Vishnu's immortal blessings instead she was burnt to ashes. That very day was celebrated as Fagu Poornima or holi. From that day onwards on every 25th March Hindus celebrate holi as a victory of good over evil. People from every walk of life, age, and caste enjoy Holi in Nepal with color, delicious food, music and dance. People fill up balloons with water and use them to throw at each other. They handfully paint each other with different colors and pour buckets of water over one another. It is a day of surrendering one self to blissful moments of complete pleasure. In Terai region, holi is celebrated on 26th March. Celebrated on 8th April, Gathan-muga holds special significance to Newari community of Nepal . Gathan-muga is also called Gathemangal or Ghantakarna. At the time when Newari community used to rely heavily on agriculture for livelihood, they were very superstitious about evil spirit spelling evilness onto their harvest and so they consulted with Tantric to permanently ward off this fear. People way back then were told to put on iron rings on fingers and hammer iron nails into door lintels to drive away evil spirit. As the time progressed, this practice also gained popularity and finally took the form of a festival named Gathan-muga. According to Nepali Bikram Sambat calendar, Bhaisakh 1st or 14th April is Nepal 's New Year's Day. National holiday has been declared on this very day. Nepalese organize parties or get together at homes and full heartedly celebrates the day with good food, music and dance. Many make resolutions for coming year. 14th April is dedicated for Bisket Jatra in Kathmandu Valley , Bhaktapur and Lalitpur. Men high on local alcohol drag a chariot carrying a statue of god Bhairabrath all around Bhaktapur. Along with this chariot, another chariot carrying God Ganesh, Goddesses Mahakali and Maha Laxmi are also pulled along. Local people approach theses chariots with Puja items for worshipping gods and goddesses. Animal sacrifices are made in a bid to please these gods and goddesses. 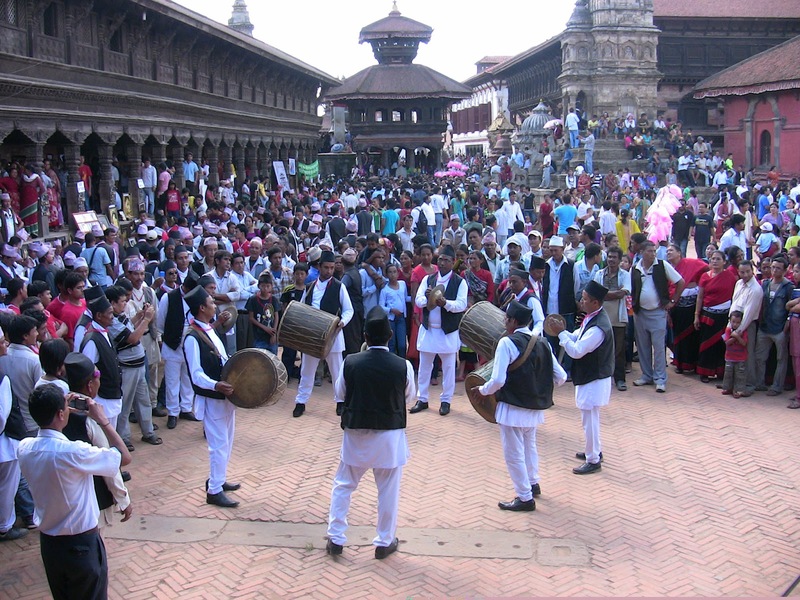 Bhaktapur features many street dramas based on mythological tale of Bisket Jatra. Thimi also enjoys this day with its tongue-piercing ceremony at Bode village. The practice of this ritual is believed to reserve a special seat in heaven for a tongue-pierced individual. On 17th April Nepalese welcome Chaite Dashain and Ram Nawami in the name of celebrating Lord Ram's victory over evil Rawan. People wake up early in the morning, take showers, put on finest of clothes and worship Lord Ram with puja items. Goats are sacrificed for religious purpose. At Hanuman Dhoka in Kathmandu , a buffalo is beheaded at a single stroke by sword and people in hundreds come to witness this. Ram Janaki temple in Janakpur is mesmerizingly decorated in a breath-taking fashion. This occasion is a major day for entire Nepali. Delicious food, drinks and beautiful clothes add more favor. 8th May is tributed to mothers as mother's day in Nepal . Depending upon their economic status, Nepalese gift their mothers with sweets, fruits, clothes and jewelries as a token of their love and affection. Mothers are made to feel very special on this particular day. For those whose mothers have already expired, they in memory of their mothers take early morning bath and pray for the departed souls. Motherless Nepalese go to Mata Tirtha to take bath and offer alms of rice, pulses and coins to the priests in the name of their mothers. A mela is also held at Mata Tirtha. Teechi is a very special festival for Upper Mustang people. It is celebrated on the last week of May and continues for three consecutive days. Legend has it that when evil Man Tam Ru destroyed humankind and brought about enormous natural catastrophe, Doorjee Sonnu came to rescue. Doorjee Sonnu was the incarnation of Lord Buddha. Doorjee Sonnu's victory over the evil was celebrated by Upper Mustang people as Teechi. On this day Choedhe Monastery organizes festival dances. 10th August is a religious day when Nepalese worship snake gods, also called the Nagas. Like other festivals, Nag Panchami is also backed up by a tale. In the ancient time Nagas halted rain from pouring over Nepal . The king of that time also happened to be a Tantric and so he used his power to make Nagas let go of rain. The king succeeded in doing so but he also honored the majestic power of Nagas by turning the day of victory into a festive occasion of Nag Panchami. On Nag Panchami, devotees put a picture of Nag high above their doorway and perform puja with necessary puja items. Offerings in the form of food are left in the yards and paddies for snakes. Nepali enjoys Janai Purnima on 19th August. Men purify their body with early morning bath, change their sacred thread placed across their chest with a new one and perform puja. Brahmins gather around Bagmati River to take a dip into the holy river and offer their prayer to his almighty. At home, a Brahmin places yellow blessed thread around the wrist of family members. Nepali family invites close relatives for a feast containing assortments of kwati, a combination of varieties of beans, as special menu. Rakshya Bandhan is a special day for brothers and sisters. On the same day, sisters put rakhi on their brothers' wrist, offer them sweets and food and pray for their longevity, happiness and prosperity. Likewise, brothers also present special gifts to their sisters. Krishnastami is the day of celebrating Lord Krishna's birthday. It is celebrated on 26th August. Ardent devotees gather around Krishna temple, offer their prayers and worship the lord with puja items. Father's day, also termed as Gokarna Aunsi, is a special day for Nepali. On 3rd September Nepalese offer their fathers with gifts including sweets, food, fruits, clothes and so on as an expression of love and respect. Fatherless Nepalese visit Gokarna and there they take a bath in the holy river and offer alms of rice, pulses, fruits, coins etc to priest in the name of their fathers. This is believed to help their fathers in heaven live in peace. Teej is a very important festival for both Nepali married and single women and is celebrated on 3rd September. Married women put on their bridal wears which is red sari and put on their best makeup to look stunningly beautiful. This day is regarded as the day when Lord Shiva's marriage proposal to Parvati was accepted by her father, Himalaya . Therefore, Nepali regard this day very auspicious. Women visit Lord Shiva's temple to perform puja and offer prayers for their husbands' longevity, happiness and prosperity. They take very strict fasting living only on water for the entire day. Hindu belief has it that if single women please Lord Shiva, they will have good husband. At night women gather, sings songs of their sorrow and pain and dance to melodious tunes. Teej is a complete women's day. Dashain is the biggest festival in Nepal . It is celebrated for 11 consecutive days during the months of October. Major events of Dashain are Ghatasthapana, Phool Pati, Mahaastami, Nawami and Vijaya Dashami. It is a celebration of Goddess Durga's victory over demon Mahisasur. On Ghatasthapana jamara, green-colored plant, is planted in majority of the Nepali household. Phool Pati announces the advent of Dashain. On Nawami animal sacrifices are made to please various forms of goddess Durga. On Dashami people dress up beautifully and visit their elders to receive tika from them. Tika is red vermillion mixed with yogurt and rice. Elders put tika on the forehead of their juniors and give them blessings. Children during this ritual are gifted with money. Kite flying highlights the occasion with fun and joy. Families gather together after tika for a delicious feast and play card, sing and dance for pure entertainment. Tihar is also one of the very important Nepali festivals. It is also called festival of lights. Nepal during this time of festival in the month of November looks amazingly breathtaking with its colorful and attractive decorations. It is celebrated for 5 days. First day is termed as Kag puja in which crow is worshipped with puja items and food. Then next comes Kukur puja and similar ritual is followed. After kukur puja, Nepali celebrates Laxmi puja, Gobardhan Puja and then Bhai Tika. After thoroughly cleaning, houses are lit with candles and electronic lights to please Goddess Laxmi and to have prosperity, happiness and harmony in the family with the blessings from goddess Laxmi. Bhai Tika is ceremonial ritual for brothers and sisters. Sisters put tika and offer food, fruits, sweets and gifts to their brothers praying for their longevity. Brothers on the other hand also put tika on their sisters' forehead and present them gifts. Chhath Parva is a very popular festival in Southeastern part of Nepal . Every year Janaki temple of Janakpur witnesses a grand ceremony on 7th November for Chhath Parva. Devotes take ritual bath from Holy River , worship God Sun with puja items and prays for their safety from skin diseases. At night temples are transformed into absolute beauty with candle and electronic lights. Ancient tale has it that an ordinary person named Bala turned into a demon after he accidentally ate burnt flesh of a corpse. Later people plotted a deception against him to kill him. After Bala's death, people regretted the fact that they deceived him and so began to practice Bala Chaturdasi for seeking forgiveness from Bala. On 30th November Nepalese after taking ritual bath at dawn scatter grains all around for building a truce with diseased souls. A mela is organized near Pashupatinath temple in Kathmandu . This ritual is ended with blowing of a horn. Christian community of Nepal celebrates Christmas on 25 th December. Christmas is a fun-filled festival that harmonizes family. Some Protestants pass the whole night of 24 th evening at their churches by singing choral and hymens songs of the Bible to remember the birth of Jesus Christ. A Christmas tree is decorated with exquisite decorative items. Gifts are placed hidden under the Christmas tree. Children are led to believe that Santa Claus has left their gifts hidden under the Christmas tree. After receiving gifts family members sit together for lavish dinner. The special menu set for the day is turkey. Hotels & guest houses are decorated lavishly in major tourist area such as Thamel, durbarmarg to attract the western tourist and perform dance parties in the night.